The Chase United TravelBank currently has an Informr score of 8.2 out of 10. This score is based on our evaluation of 13 sources including reviews from users and the web's most trusted critics. Chase United TravelBank is typically available to those with good credit scores (650 or greater). Though the United TravelBank card offers a good rewards rate for no annual fee, a traditional cash back card would probably be a better choice. You can find high-value United perks with the other United cards that Chase offers. But this card fits the bill for a simple, no-frills credit card that earns United rewards. The United TravelBank card puts a new spin on travel rewards. It's sure to appeal to travelers who want to earn a higher rewards rate on flights with no annual fee. Just remember, however, that the rewards you earn can only be redeemed on United flights. A great first travel rewards credit card. It’s easy to use, easy to understand, and pretty much free of red tape. If you’re a loyal United Airlines flyer with excellent credit who likes to splurge on in-flight refreshments, the new United℠ TravelBank Credit Card from Chase could save you a lot of money. The card is most rewarding on United purchases, as you might expect. Airfare, seat upgrades and baggage fees yield the equivalent of 2% cash back, while in-flight drinks and snacks score you a whopping 25% back. But the TravelBank Card’s base earning rate isn’t too shabby, either: 1.5% back on all other purchases. 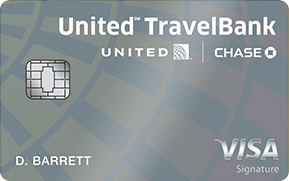 The United℠ TravelBank Card is the only no annual fee credit card co-branded with United. That, coupled with the fact that it provides good fixed-rate rewards makes it worth recommending. This is a great credit card for you if you are a frequent traveler with United and want to earn rewards towards travel just by paying for regular purchases. If you consider the benefits, it's fair to say that United℠ TravelBank Card has more pros then cons. There are competing credit cards that offer 1.5% - 2% returns either as cash back or as statement credits towards any travel purchases. In most respects, these rewards would be better than earning United TravelBank credit that’s somewhat restricted. But with no annual fee, no foreign transaction fees, and strong cardholder benefits, some travelers may still find the to be worth considering. The United TravelBank Card is great choice for those who travel with United Airlines frequently! This card is a great every day card earning you 1.5% in TravelBank cash per $1 spent on all other purchases! On top of that, this card comes with NO foreign transaction fees and NO annual fee. The JetBlue Plus Card is probably the more attractive option for travelers with great credit scores and who don’t mind paying an annual fee.